Intimidation Clothing is pleased to announce its sponsorship of former WEC bantamweight champion Chase Beebe in his upcoming bout this weekend in Cleveland, Ohio. Beebe (24-10) is set to take on Frank Caraballo (12-5) for the NAAFS featherweight title at Rock N Rumble 7. Also a 4-time Bellator veteran, Beebe – along with his brother Carson – is a longtime member of Team Intimidation. Beebe comes in looking to snap out of a 2-fight losing streak, but before that he was on a 6-fight winning streak. Beebe began his pro MMA career in 2006 and proceeded to win 11 of his first 12 fights winning the WEC Bantamweight belt at WEC 26. Following a successful defense at WEC 30, Beebe lost his belt to Miguel Torres at WEC 32. After a rough patch that saw his pro record fall to 11-6 overall, Beebe has gone 11-3-1 in his last 15 fights. Chase Beebe is the older brother of fellow Intimidation-sponsored Carson Beebe as the popular brand has sponsored both Beebe brothers multiple times in the past year plus. Along with sponsoring Beebe, Intimidation is also set to sponsor headliners Josh Stansbury and John Hawk, along with pro featherweight Antonio Castillo Jr., and several amateur fighters. Intimidation will also be on hand selling its popular brand of t-shirts, hats, hoodies, fight shorts, and more and is a title sponsor for the Rock N Rumble 7 event. Team Intimidation fighters continue to receive high-profile fights, including sponsored fighters in action live on Spike TV and AXS TV. That was the case for welterweight Bryan Baker, a fighter newly sponsored by Intimidation Clothing for his welterweight semifinal at Bellator 90 last week. “The Beast” was on the wrong end of a night of exciting knockouts and finishes, as he fell to former tournament winner Douglas Lima in a bout where he entered as a late replacement. Meanwhile, over on XFC 22 on AXS TV on Friday night, Jason Hicks dropped a decision in the night’s main event. However, Jeremy Severn picked up a win on the XFC 22 preliminary card in Charlotte, North Carolina. Former WEC champion Chase Beebe had his 6-fight winning streak snapped, as he dropped a decision to Travis Marx on Thursday’s preliminary card at Bellator 90. The Chicago-based fighter will now look to start yet another winning streak the next time he steps in the cage. At the Intimidation-sponsored Mad Wolf Promotions event in Indianapolis, Indiana, ammy welterweight Dustin Parrish moved to 6-0 and captured the 170-pound title while also being sponsored by the popular clothing brand. He submitted Justin Curtis in just 34 seconds, and continued his streak of 6 straight first round stoppage wins. Meanwhile, Cameron VanCamp, another of the top-ranked amateurs in the state of Indiana, was also in action in the Capital of the Hoosier State and while the fight did not go as planned, VanCamp and his brother Kyle and proud new members of Team Intimidation. This week, the Intimidation crew will be in Columbus at the Arnold Sports Festival selling its popular clothing, beanies, and more at booth 110. Intimidation will also be at the Rocktagon 24 event in Cleveland. Intimidation Clothing is proud to announce its sponsorship of former WEC bantamweight champion Chase Beebe at Bellator 90. A three-time Bellator veteran, Beebe was formerly the #1-ranked 135-pound fighter in the world. Beebe will face Travis Marx (19-4 MMA, 1-1 BFC) in a bantamweight tournament qualifier bout. Chase Beebe (24-7-1, 2-1 Bellator) began his pro MMA career in 2006 and proceeded to win 11 of his first 12 fights winning the WEC Bantamweight belt at WEC 26. Following a successful defense at WEC 30, Beebe lost his belt to Miguel Torres at WEC 32. After a rough patch that saw his pro record fall to 11-6 overall, Beebe has gone 11-1-1 in his last 13 fights and is currently riding a 6-fight win streak. Chase Beebe is the older brother of fellow Intimidation-sponsored Carson Beebe as the popular brand has sponsored both Beebe brothers multiple times in the past year plus. Intimidation Clothing is pleased to announce its sponsorship of rising featherweight fighter Cory “The Irish Car Bomb” Mahon in his upcoming bout at Rocktagon 23 on January 19th in Cleveland, Ohio. The Indianapolis native Mahon (10-5) will take on Cody Stevens (9-5) in a highly anticipated 145-pound bout at the event. A Judo Brown Belt, Mahon is a submission specialist who possesses 9 of his 10 pro wins by way of tap out. A six-year pro, Mahon has competed on some of the top regional promotions in the Midwest, including Intimidation-sponsored Colosseum Combat, Legends of Fighting Championships, Ring of Combat, and more. He has also faced WEC/Bellator veteran Dave Jansen, TUF veteran Dustin Neace, former WEC champion Chase Beebe, Bellator vet Chris Liguori, and holds notable wins over Brady Hovermale and Ryan McIntosh. The sponsorship of Mahon is part of a continued expansion by the Intimidation brand in the state of Indiana by sponsoring events and fighters and fellow Hoosier state native Anthony Lapsley will also be sponsored on the Rocktagon card. Intimidation Clothing had yet another successful weekend, with sponsored fighters picking up wins in three different events in two states. Isaiah Chapman, Torrance Taylor, and Chase Beebe picked up wins in the professional ranks as all represented the popular clothing brand en route to victories, moving each a little further up the MMA ladder. Intimidation Clothing sponsored both the top-ranked bantamweight and top-ranked lightweight in the state of Ohio at NAAFS: Night of Champions 2012, and both came away victorious with stoppage wins. Isaiah Chapman moved his unbeaten professional record to 4-0 with a second round guillotine submission over Dustin Kempf, who was also sponsored by Intimidation. The fight was a clear favorite for Fight of the Year in the state of Ohio, and “The Beast” remains perhaps the top bantamweight prospect in the United States. Known as “The Tyrant,” Taylor picked up his second TKO victory of the year after being out for an extended period to finish school. The Cleveland native stopped Gino DiGiulio in the second round of a back-and-forth bout in the co-main event at Night of Champions. At Flawless Fighting Championships 2 in Chicago, Intimidation-sponsored fighter Chase Beebe picked up a unanimous decision over The Ultimate Fighter 15 alum Chris Tickle in the night’s co-main event. Beebe moved his overall record to 24-7-1 and won for the sixth straight time; he also stayed unbeaten while being sponsored by the Intimidation brand. On the same card, Garrett Gross suffered a disappointing loss but had a great performance. Intimidation Clothing also sponsored several amateurs at events in the Midwest with JT Miller and Wes Hanson at the NAAFS event. Also sponsored was top-ranked Ohio amateur heavyweight Tim Dunn in the main event at OFC 14 near Columbus, as “Fatboy” picked up a first round TKO to extend his winning streak to four in a row. With his final amateur bout and a 11-2 ammy record now behind him, Dunn expects to turn pro in February. Intimidation Clothing is proud to announce its sponsorship of former WEC bantamweight champion Chase Beebe at Flawless Fighting Championship 2 this weekend in Chicago. A three-time Bellator veteran, Beebe was formerly the #1-ranked 135-pound fighter in the world. Beebe will face The Ultimate Fighter 15 veteran Chris Tickle in the evening’s co-main event. Chase Beebe (23-7-1) began his pro MMA career in 2006 and proceeded to win 11 of his first 12 fights winning the WEC Bantamweight belt at WEC 26. After a successful defense at WEC 30, Beebe lost his belt to Miguel Torres at WEC 32. After a rough patch that saw his pro record fall to 11-6 overall, Beebe has gone 9-1-1 in his last 11 fights and is currently riding a 5-fight win streak. Chase Beebe is the older brother of Intimidation-sponsored Carson Beebe. Intimidation Clothing is proud to announce its continued sponsorship of rising bantamweight prospect Carson “Little Juggernaut” Beebe (13-1) as he heads to California to take on Rolando Velasco (7-2-1) at Tachi Palace Fights 15 in Leemore, California. The bout will serve as the evening’s co-main event. 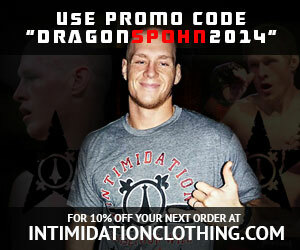 Intimidation will be sponsoring Beebe for the fourth consecutive fight, all of which he has won. He is currently riding a seven-fight winning streak, including his most recent victory over James Porter at Colosseum Combat XXII in September. Beebe, the younger brother of former bantamweight world champion Chase Beebe, holds a 13-1 pro MMA record, including seven consecutive wins. Beebe was also a contestant on season 14 of “The Ultimate Fighter.” A Gilbert Grappling product, Beebe is one of the top young stars in the sport, and he is ranked on many top prospect lists. The 24-year-old also starred as a wrestler on the mats at Purdue University before making his pro MMA debut in 2010. Beebe is pictured with Colosseum Combat promoter Mark Slater after Beebe’s win at HFC 12 earlier this year. Intimidation Clothing is a fast-growing brand of MMA themed apparel & training gear based in Ohio with a strong presence throughout the Midwest USA and a growing national presence regularly being featured on multiple sporting events on MTV2, FUEL TV, EpixHD, AXS TV and SportsTime Ohio as well as MMA highlight shows on Spike TV and HDNet/AXS TV. In addition to over 70 styles of high-quality, bold t-shirts and sweatshirts for men, women and children. The company is also becoming known for their premium-quality EliteFighter MMA board shorts, as well as vale tudo shorts, rashguards and more available online at IntimidationClothing.com. Fans can like the Intimidation brand on Facebook and follow Intimidation on Twitter. Intimidation Clothing had yet another banner weekend, as Intimidation sponsored pro fighters across the Midwest. Matt “Kid Lightning” Veal (10-8), Antonio “The Mexican Muscle” Castillo Jr. (5-4), Chase “The Rage” Beebe (23-8-1), and Tamikka “Boom Boom” Brents (1-0) all picked up victories, as well as several sponsored amateur fighters including Quinton Cooperider (9-0) at the NAAFS event in Columbus. Also, Pastor David Bever Jr. had an inspiring performance while fighting for a good cause in his MMA debut despite losing via submission in the second round. Canadian featherweight Matt Veal (@KidLightning86) moved his record to 9-1 while competing in Minnesota, as he earned a first round submission over Benly Xamonty at the Intimidation-sponsored Driller MMA/SEG event in South Burnsville, MN. A Bellator veteran, “Kid Lightning” has now earned stoppages in nine of his ten career victories, including seven submissions. Castillo (@LaMexicanMuscle) earned a dominant unanimous decision victory over Bobby Emmons in the main event at the Intimidation-sponsored NAAFS Caged Fury 20 event in Columbus, Ohio. A rising star in the featherweight division, Castillo is now 3-1 in his last four bouts, with his lone loss coming to NAAFS featherweight champion Frank Caraballo in June. He’ll return to the cage in December against Casey Craft at “OCC: Seasons Beatings III” in Toledo, Ohio. Intimidation also went 2-0 at the Fight Hard MMA event in St. Charles, Missouri, as Beebe (@ChaseBeebeMMA) and Brents (@BoomBoomBrents1) earned dominant first-round stoppages just outside of St. Louis. The former WEC bantamweight champion Beebe won for the fifth time in a row, as he submitted Javon Wright with a rear naked choke in just 4:11. He’ll return to the cage in December against “The Ultimate Fighter 15” alum Chris Tickle in his native Chicago. Brents won her pro debut, as she made use of the now-legal elbows in pro MMA to earn a TKO over Jessica Halverson.